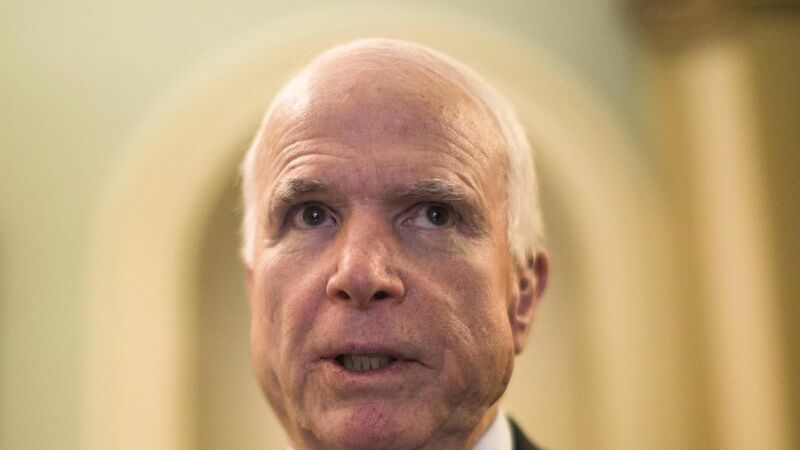 McCain: Trump facing scandals of “Watergate size"
The Daily Beast's Tim Mak gave a detailed account on Twitter Tuesday night of Senator John McCain's response to reports that President Trump asked former FBI director James Comey to shut down the bureau's investigation into Michael Flynn. The senator, while being honored at the International Republican Institute, took the opportunity to speak his mind on the recent Trump scandals, which he claims have hit "Watergate size and scale." McCain's advice to Trump? The same advice others had given Richard Nixon: "Get it all out." "I think we've seen this movie before. I think it appears at a point where it's of Watergate size and scale... the shoes continue to drop, and every couple days there's a new aspect. His advice: "The same thing that you advised Richard Nixon, which he didn't do... get it all out... it's not going to be over until every aspect of it is thoroughly examined and the American people make a judgment. And the longer you delay, the longer it's going to last." "I've known this guy [Russian Foreign Minister Sergei] Lavrov for 30 years, he's an old KGB apparatchik stooge, and Putin is a murderer and a thug... to have Lavrov in the Oval Office and be friendly with the guy whose boss... sent aircraft with precision weapons to attack hospitals in Aleppo, I just think it's unacceptable."